Dr Christopher Lloyd Clarke is a music composer who specializes in music for deep relaxation, meditation and healing. His soothing music has been featured in countless guided meditation recordings and is utilized by meditation teachers, holistic healers, psychologists, personal development consultants, day spas and medical facilities throughout the world. Christopher's extensive experience with meditation coupled with his studies into metaphysics and his ongoing involvement with a global network of therapists and healers has given him a unique insight into how to create music that encourages deep relaxation and altered states of consciousness. As a best-selling meditation music artist, Christopher's music is loved both by meditation enthusiasts and by a variety of professionals who rely on his music for it's therapeutic benefits. Christopher resides in Torquay, a popular holiday destination on the southern coast of Australia. Drift off in a trance like state of peace and tranquility whilst you are being massaged. Daydreams has a super dreamy like feel to the music that will slowly send you into an awesome state of deep relaxation. It is neither happy or sad music, but it is certainly dream like and soothing, like you are being wrapped in your favourite, warm and cosy blanket. The music works its magic – one minute you are listening intently, the next minute you are aware you have been asleep for the past hour! This is a long playing track ( a little over 1 hour) and is perfect for massage, meditation, healing sessions or to drift off to sleep after a hard day at work (Ideal for insomniacs). Crystal Rain is a musical work of extraordinary peacefulness and purity. This therapeutic music is a perfect complement to meditation. It is wonderful for energy cleansing and is highly recommended for anyone suffering from anxiety or depression. It’s hard to imagine a more serene combination of sounds – gentle rain combined with the hauntingly beautiful tones of Quartz Crystal Singing bowls. This spacious musical journey is yet another wonderful creation by renowned composer, Christopher Lloyd Clarke. His intuitive performance with Quartz Crystal Singing Bowls has resulted in deeply relaxing music with powerful healing properties. The tranquility of a Zen master’s lifestyle is captured in this soulful and exotic performance. You can just imagine him sitting there by the river, draped in robes, his fingers dancing across the strings of his harp in perfect harmony with the natural world around him. He knows when to play, and he knows when to let silence speak. He understands that the space between the notes is as sacred as the notes themselves, and in this balance he achieves perfection. The River of Zen is wonderful background music for meditation, or for those times when you just want to soothe your mind and lighten the mood around you with gentle, spiritual music. Become weightless, carefree and a light in this world. This soothing, celestial soundscape is ideal for relaxation, to chill-out or to uplift your mood for the day. Across The Sky is ideal for meditation and to assist in the process of clearing your mind and letting go. Close your eyes and imagine yourself walking through candle-lit corridors of some faraway temple in Tibet. Enlighten Me catches the wonderful essence of this harmonious place within you. This soul-deep spiritual music features over 40 unique temple bells, Tibetan singing bowls, chimes, gongs and more – all surrounded with the sound of a peace keeping flute and angel choirs. The beautiful, drone of Tibetan singing bowls provides a hypnotic foundation to the music, while the brighter sound of bells and chimes engage the shadows with purity and light. Enlighten Me was inspired by the monastic life of Zen masters. It’s a tribute to those rare enlightened beings that spend their days in deep meditation. This is their song. Any time you’re in the frame of mind to unwind, cushion your spirit and raise the ambiance surrounding you, Adrift is the ideal sound option. This music is incredibly serene and very soothing. You’ll discover simply no chimes, no pianos or even extravagant instrumentation, no unforeseen adjustments in volume level or even pace ; simply a peaceful musical encounter that results in uncomplicated tranquility . There is no “fat” in this music. No excess. Just the pure essentials…swirling white noise, the constant hypnotic drone of the binaural beats, and a gentle wandering melody that was created with a bowed glass instrument. This intoxicating combination of sounds will relax you to your core. Length: Tranquil Chambers – 27:00. The Core – 40:00. A deeply relaxing musical experience in two parts. The first track, “Tranquil Chambers” is a placid, melodic composition. The music is so expressive and heartfelt. Symbolically, this music represents the beginning of your journey within. Over the course of 27 minutes you slowly sink into an ever deepening state of relaxation as your emotions settle and you begin to drift free from your normal waking consciousness. Track 2, “The Core” will take you much deeper. This music can lead to profound feelings of inner spaciousness and a connection to the core of your being. For some people, experiencing The Core can even lead to spiritual insights and spontaneous healing. Listen at a very quiet volume with your eyes closed and relish this sublime journey. Like the nature of mind itself, Untold Depths is without borders, without defined structure, without limitation. This soothing, imaginative soundscape provides just enough stimulation to absorb your attention and draw you into a deeply relaxed state, but not so much stimulation that it ever becomes distracting. Listen quietly with headphones for a transcendent experience. Ascension is one of the most relaxing and euphoric meditation music recordings you will ever experience. This beautiful music accomplishes something rather rare in that it is both relaxing and inspiring at the same time. Constellation by Dr. Christopher Lloyd Clarke, might be a little different to the kind of meditation music you are used to, but it is fantastic for achieving deep transcendent states of consciousness. This white noise download comes with theta frequency binaural beats and is recommended for deeper states of relaxation. This choice of 7 comforting tracks can awaken, bathe and also enliven the vitality stores of your whole body, while soothing you from head to toe . This delightful music is wonderful for chakra meditations; however you could enjoy it whenever you desire to relax, open up your heart and clear your thoughts. In this serene angelic music, heavenly choirs are blended with soothing synthesized sounds and showered with ethereal chimes. In Spiritus can be emotionally stirring at times, but it’s so gentle that the music is never anything less than completely relaxing. Preview Mindfulness Bell Vol 1. Mindfulness Bell Volume 1 is a fantastic meditation tool that was designed to enhance concentration and mindfulness training. It features the sound of a specially selected meditation bell that will really help to clear your mind and guide you into a deep state of meditation. This high quality mp3 download includes a 60 minute version for formal meditation practice, and also a separate “5 Minute Mindfulness” recording that’s perfect for those times when you just want to clear away mental clutter and get on with your day. Mindfulness Bell Volume 1 contains nothing but the pure sound of a Tibetan singing bowl being repeatedly struck with a soft mallet. This gentle music includes the soothing sound of waves breaking gently onto a sandy beach, while the soft, hypnotic pulsing of the bassline lulls you into a state of deep relaxation. Deep Within utilizes an interesting musical technique called “Sonic Mantras”. Sonic mantras are simply a repeating series of notes that provide a mantra-like foundation to the music. These soft, repetitive tones are a musically analogous to a hypnotists swinging pendulum, or the chant of a monk in deep meditation. So relaxing. An hour of uninterrupted heavenly music that celebrates the joy of life and everything we yearn for as human beings – elation, love and inner bliss. This sublime music evolves slowly and gently – mysterious ethereal soundscapes gradually blooming into angelic crescendos…before receding into soft, celestial passages that envelop the mind and open the heart. The Ecstasy of Being is a musical work of great emotional depth – a composition that reaches the heights of elation whilst remaining utterly peaceful. 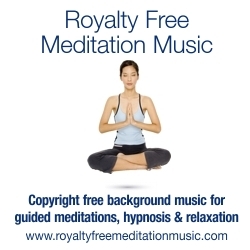 This music contains no bells or pianos or percussive instruments – it’s free from any sounds that might jolt you out of a state of deep relaxation. Let go now…feel yourself sinking into a state of complete relaxation as these gentle sounds sooth your heart and mind. This simple, heartwarming music moves very slowly and gently, and never strays too far from its main theme. There are no unexpected twists or turns in the music, so it will never jolt you out of a state of deep relaxation. This beautiful music is like a gentle massage for your mind, washing away every last drop of tension and soothing you from head to toe. Deep in the forest, hidden from the world, a zen master rests quietly in the gardens that encircle an ancient temple. His eyes closed, he plays a wooden flute as wind chimes sway gently in the breeze. The Temple Gardens captures the feeling of this magical place. Please note: The flute is played only for the first 5 minutes – a short song to herald your arrival in the gardens – and then it concludes, leaving only the sound of wind chimes and wildlife. So beautiful and inspiring…Heaven's Gate will open your heart and fill you with a sense of serenity and spirit. This gentle music is very calming, but it also has moments of great emotional depth and has been known to bring a tear to the eye of some listeners. Seriously heart-warming indeed! For thousands of years, tribes have used rhythmic percussion sounds to enter trance-like states. With this tradition in mind, Tribal Eve was created. Slow, rhythmic tones and gentle percussion weave together to create a musical tapestry that is soothing, hypnotic and utterly entrancing. Similar to a bathing of purifying illumination, Celestial Light will certainly cleanse you, calm you and also motivate you all at one time. This stunning music is relaxing; however it also offers an aliveness to it . . . a delicate strength that is certainly quite hypnotic and also rejuvenating. Celestial Eve is the perfect option when you would like background music that will assist you to be submerged into an intense condition of comfort without at any time being a distraction . . . this gradual shifting music shimmers and also sparkles, yet includes absolutely no jarring tones or even noisy bells. Lovely. Heaven and Earth is so relaxing it will make you feel as though you are right there on the massage table, being treated to a full body, mind and spirit music massage! It is bound to send you into a deep state of relaxation, so much so that your body may become heavy and groggy, and possibly even send you off into a deep sleep. The music can lead to emotional release and healing. If you want to discover a heaven on earth this MP3 by Dr Christopher Lloyd Clarke is the perfect music for you. Wanting music for massage? This is the MP3 to download today. Bells Beach, on the coastline of Victoria, is renowned as one of the best surfing beaches in Australia, if not the world. We capture the essence of the beach in the early hours of the morning, as the waves crash the shore and lap up the glorious white sandy beach. This MP3 has no music, no obtrusion's, only pure 100% mother nature! Use this recording for meditation, relaxation or simply to bring the ocean right into your world at any time, day or night. A beautiful, high quality MP3, crystal clear recording of a sun-shower rainfall. There is no loud thunder claps or wind, it was truly a glorious sunlit day. As the clouds rolled over and the rain started to fall, a rainbow appeared on the horizon. It might sound really cheesy, but it simply was one of those picturesque days. Use this MP3 to fall asleep to. It even relaxes your pets too! Heaven and Earth is a very soothing musical soundscape that is wonderful for deep relaxation, stress relief and emotional healing. This hour of uninterrupted music opens with an earthy, grounding tone – a sound that was created by stroking the strings of an acoustic guitar with a cello bow. This assertive sound quickly softens as additional instrumentation is introduced, but remains with you throughout the entire song, slowly coaxing you into a state of deep relaxation. Oscillating synthesized sounds, Tibetan bells and gentle choirs all play their part in this incredibly calming music. Theta binaural beats are used so headphones are required for this track to work best. Yes, thanks! Agree! His work is amazing. Glad you like it.